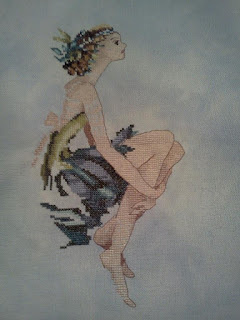 Another week has flown by and I have been working away at my Bliss Fairy. I love her so much. I'm just really enjoying her - sometimes you really connect with a project and this is one of them. I am quite surprised really because I have always found her beautiful but I never had her on my "to do" list. She just quietly called to me and I listened to her little whisper. Let me say, I am surprised at how large she is. I always thought of her as a little fairy - but she is quite big. 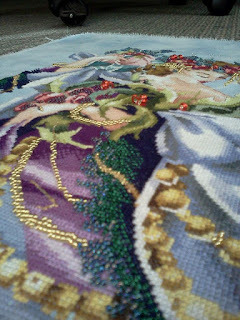 With that said, she is a smooth and easy stitch - well after confetti hair - she is a smooth and easy stitch. I have had a few comments on her big ole feet - but having size 10 feet makes me appreciate this big footed fairy. 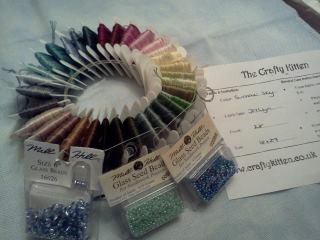 Once again a shout out to Crafty Kitten for this Summer Sky 28 count Jazlyn. Its much more baby blue/sky blue than my photo shows. And where is Cleo you ask.... I haven't finished her! I know - isn't that shameful!?! 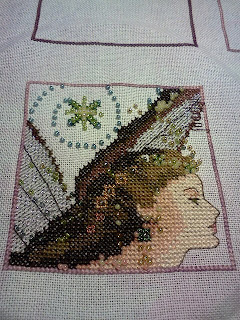 I put in another 2 sittings of beading over the weekend - about 2 hours and I'm not done! 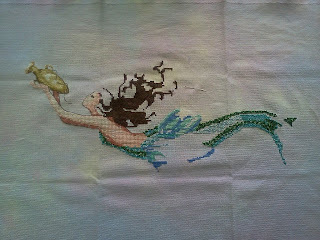 Its crazy how much beading this mermaid has. I really could finish it probably in one more sitting but seeing as I'm so loving Bliss right now its hard to turn to another project. That is why I must stay a disciplined diva and finish all projects before a new start. On a non stitching note, things are going ok with the moving plans. I talked to my boss and it looks like I can get a transfer - huge relief! Also my husband got a great lead on a job and I think we will know within two weeks if that is accepted. Now we just need the house to sell. There has only been two showings. Its seems the market is cold right now. We just have to wait it out for awhile because there isn't much else we can do. We have discussed dropping the price, but where there is no one out buying its kind of shooting yourself in the foot - it is priced right - we just need to hold out and be more patient! Thanks to everyone who reads this blog and comments - it is a true source of happiness for me! Yes, I did it. I started Bliss Fairy. 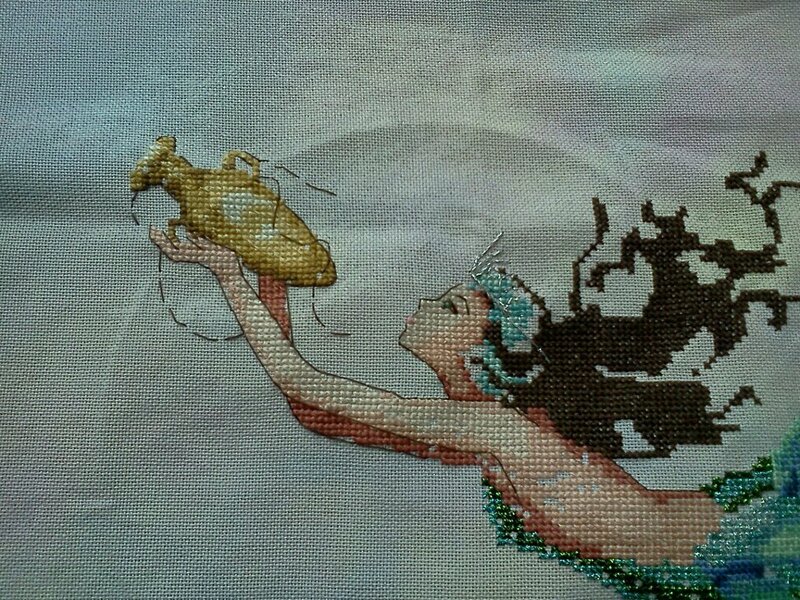 I'm not quite done with Cleo (Meditereanean Mermaid) she just needs some more beads - so photo coming soon! 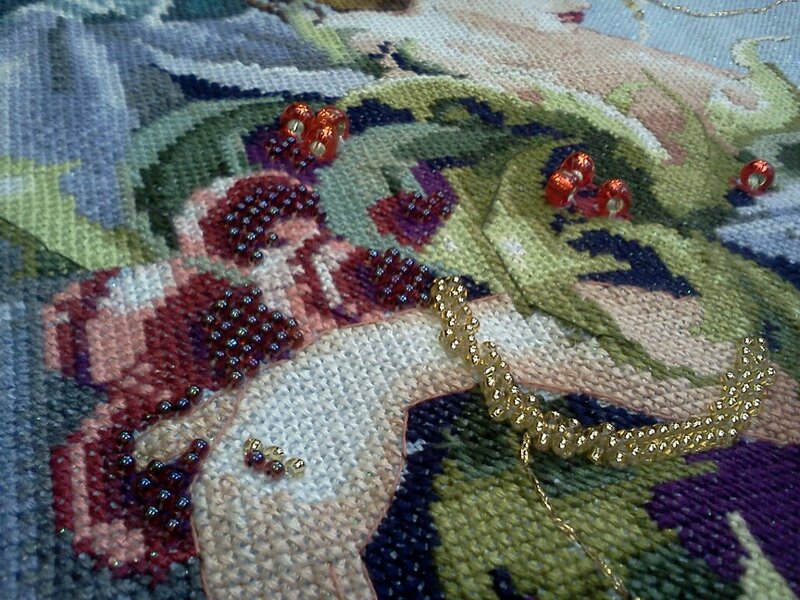 My opportunities to stitch this week have been "stolen" moments amongst busy times. I knew I was going to get to stitch on my lunch hours in the library and also my Tuesday night outing to the local bookstore/coffee shop - both not good beading places so there is my justification for the new start. I normally insist on a finish before a start but if I had of done that there would have been no way for me to stitch this week - and let's face it - my sanity requires it. 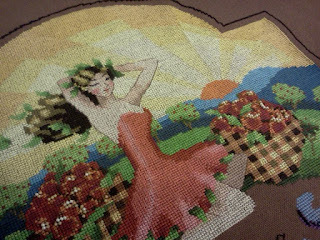 Here is my current progress on "Bliss". 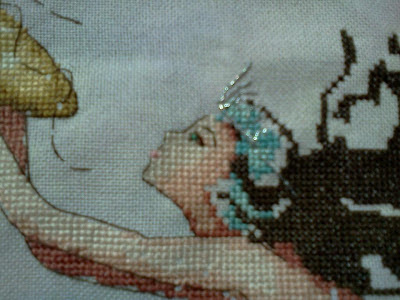 She is being stitched on 28 count Jazlyn on Summer Sky by Crafty Kitten (xoxo). The photo looks grey - but its a beautful soft summer blue - I will get some better shots as I stitch more. Anyone familiar with this design will notice I changed her eye and eyebrow. I always felt that for someone called the "Bliss Fairy" she looked pained - almost heart broken. So I gave her a wide open eye and a soft eyebrow curve. I adopted this eye by looking at other Mira's that I thought had pretty faces - it's a combination of Villa Mirabilia and Cottage Garden Fairy and Jocelyn Mattatall! So my goal for this weekend is finish Cleo and post a new gallery of her for you. I also want to get a lot more done on Bliss. I'm feeling really connected to her and I realized that I haven't done a Mira Fairy for five projects - the last one was Adia. So I'm due! 2. Show thanks to the blogger who awarded the Liebster to you by linking back to their blog. 3. Post the award on your blog. List the bloggers you are giving awards to, with links to their sites, and comment on their blog to let them know that you have give them the award. 4. Share five random facts about yourself that people don't know. Melanie the WIP Slayer! What a fantastic name and concept for a blog - I just love your work and great blog! 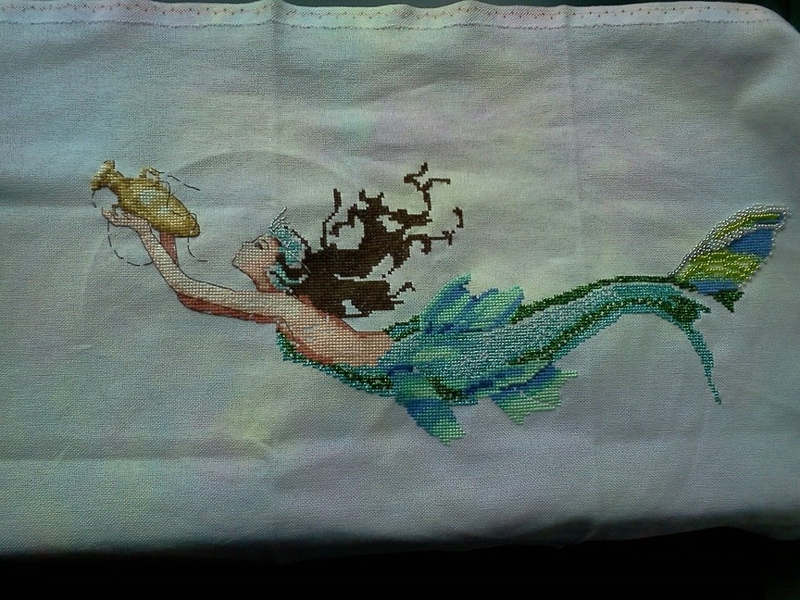 Tracy's blog - The Mirabilia Stitcher - this is actually one of the first blogs I ever regularily followed and although she is getting up there in followers she is still shy of 200! Leslie's Stitching Under the Sea - she does amazing work and I adore her! 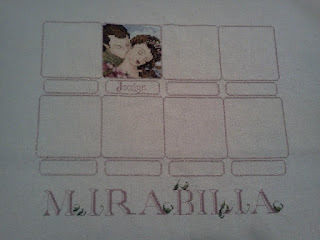 Mrs. Marthi - a Passionate Mirabilia Stitcher - this girl needs some more followers - a great blog - she does a lot of stitching! Melissa's Stitching Room - this girl has a lot of Mira's on her blog and I love them all! 1. 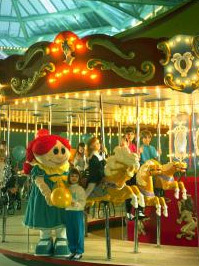 I was the mascot (Crystal) for a local amusement park Crystal Palace while in high school. 2. I have owned three pet rats in my lifetime and they were all wonderful sweet little pets - Sydney, Minnie and Sandy. 3. I attended no less than 14 schools growing up - we moved a lot! 4. I am scared of waves - as in water. 5. 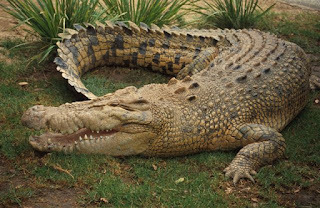 I really like Crocodiles and reptiles in general but not snakes. I got to hold a baby Crocodile while I was in Cuba. I wanted to share an update of "Cleo" again. I did a lot on her this week early on but sore fingers made me take a two day break from her. I am motivated to finish her now because tomorrow I find out if my sister is having a boy or a girl - and that will determine if this piece is for my sister or my niece...My sister and I decided if its a girl it goes in the nursery, if its another boy she gets to keep her in her bedroom! I want to show you a close up of her face. I made some changes from the pattern. I did her with an open eye, gave her an eyebrow and made her lips and chin less square. I think she still looks very Mirabilia after all I used an eye from another pattern, but much less "squinty". Closer look but blurry - sorry. I just wanted to finish this little post by saying thank you to everyone for the encouraging comments! My house is officially on the market and as of 5pm today we will have had two showings. I had a chance to talk to my employer and they seem understanding and supportive. My boss here in the Atlantic region is going to encourage her counterpart in the West to make room for me out there. That would be so ideal. I love my job and hate the thoughts of leaving the company. 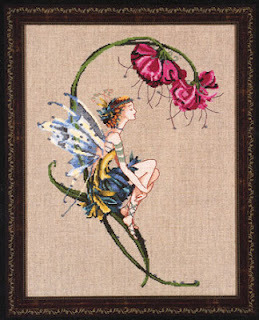 One last thought - since I am nearing the end with Cleo, I am always planning the next project and there is about three that I keep really wanting to stitch - but over the last two weeks Mirabilia's Bliss Fairy has been calling to me! So I did a floss toss and she is up next! I also have plans on stitching her facial expression a bit different - I am using another Mira eye (an open one) and I arched her brow different so she looks more relaxed in my opinion.... but I am sure I won't be able to show you for awhile, I have to finish Cleo first... but as we are all voyeurs... here is my floss toss. This is going to be stitched on 28 count Jazlyn "Summer Sky" by Crafty Kitten. I have been working on Mirabilia's Mediterranean Mermaid - who I call "Cleo". She is on 32 count Daybreak by Crafty Kitten. She is extremely pretty - most of her tail is all kreniks. I love the blues and greens. 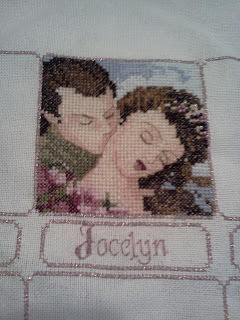 I am stitching this for my pregnant sister Jamie. If she is having a girl - it is going in the nursery - if she is having another boy (she already has two! ), it is going in Jamie's bedroom. I much like the idea of stitching her a Mira versus a baby sampler - I'm just not in that head space right now. So now the VENT.... 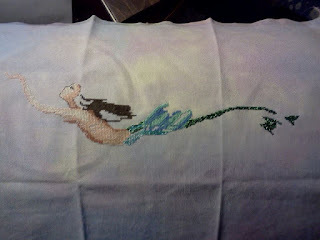 I intended this to be a stitching blog but its also going to be my outlet when one is required. My husband and I have made a HUGE decision to move from the East Coast of Canada to the West Coast of Canada - and the decision has made us very unpopular with our extended family. Here is a little back ground - my husband just finished his Registered Nursing degree. He is currently is a Licenced Practical Nurse here in New Brunswick. We love our home, our street, our town, the school the girls go to, the daycare, my job.... but the reality is we live in a province that is struggling under massive debt and as a result they have put a spending freeze on many things - including health care. There is a current hiring freeze on RN's. My husband has been looking for a job here for months - there is none. We even looked in Halifax, NS - about 3 hours away - there is none. Here is the kicker!...... There are 100's in Alberta. Full time. Based on this we have chosen to go where our family has a chance to prosper. This is not going over well with the extended family - which we expected - as we have two little girls that are 8 and 5 1/2. Some how, this decision that we struggled to make, for the betterment of ourselves, has become percieved as a means to somehow punish our extended family and shut them out of our lives. That is far from the truth. The one thing holding us back is the fact that we would have to leave our extended family - but instead of getting concern and support we got guilt tripped. So here it goes (and this is addressed to more than one person): I'm sorry that this decision has hurt your feelings - it hurts our feelings too. I wish we didn't have to move to prosper but we have a young family and we need to take care of ourselves. You are always welcome at our new home - in fact we are buying a bigger house that specifically has an extra room with a full bathroom attached - you can stay a day, a week, a month and once you get here you won't have to pay a cent - its on us. Yes, the plane ticket is expensive about $700 - but that is $2 a day. Trust me, our decision to move is not to punish you, or take the kids away from you - its for us to have economic prosperity and for us to have a chance to explore that side of the continent with our children. The world is shrinking. We know its far - trust me - we know.... but it will all be okay. This decision is about the four of us, taking care of the four of us. Okay... one last post for today! I referred to a Round Robin concept a while back and I'm proud to say it has come to fruition. 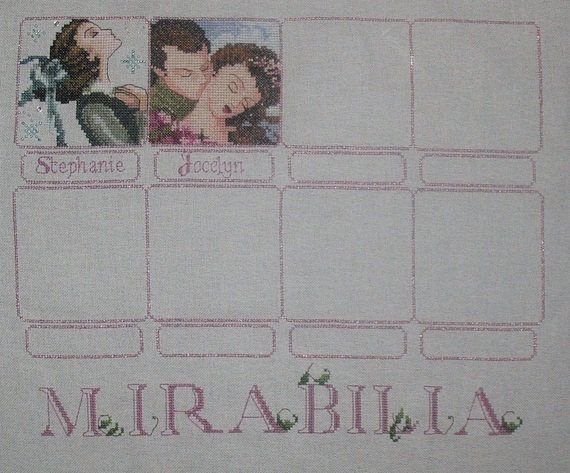 I have stitched the outline and used the alphabet from Mirabilia's Nouveau Sampler for the title at the bottom. 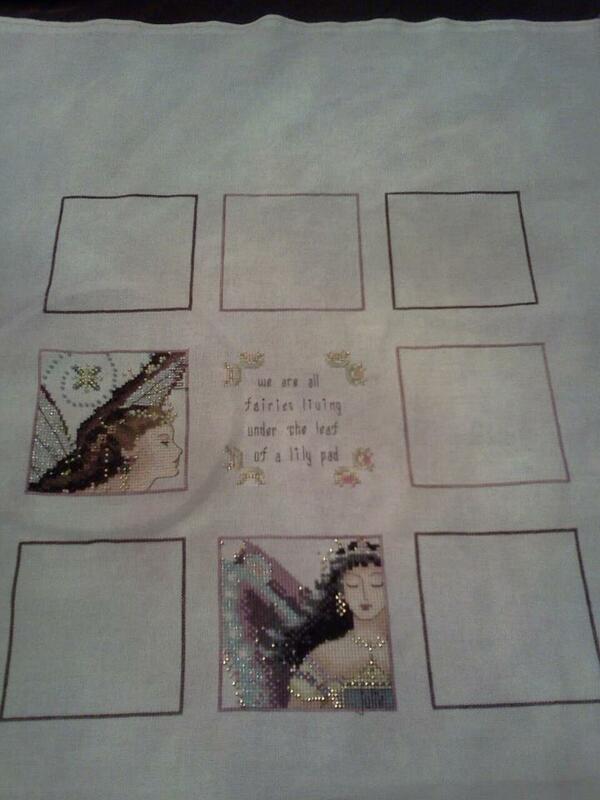 Here is a picture of my Round Robin after I have the outline stitched and my block - Mirabilia's The Kiss stitched up! The outline of my blocks are stitched in pink krenik. My theme is "Deep Breath Moments" - you know when you need to take a big breath and just exhale. Here is a close of up my block. 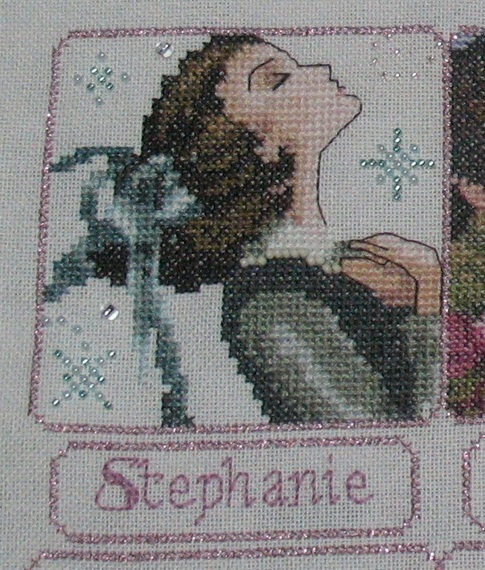 The alphabet I used for my name came out of a book I have called 2001 Cross Stitch Essentials. Since then we have done our first round and Stephanie Corson added Stargazer to my Round Robin. I love Stephanie's work! 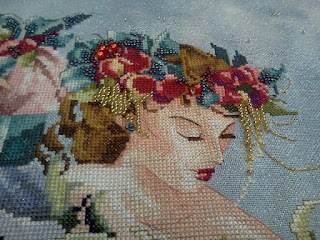 Here is a close up of her Stargazer. She added some extra bling - we Mira lovers have to have lots of bling! I also wanted to share two pictures of the the work I did in the first round. This is Julie Merten's piece. I stitched the Cottage Garden Fairy. Her theme is Fairies. She stitched Fairy Treasures in her box. This fabric is from Sparklies and I believe it is February Fabric of the Month from 2012. When it rains it pours, eh? Here are some pictures of my beautiful Mirabilia's Golden Girl Apples - who I affectionately named Gorja Grace. 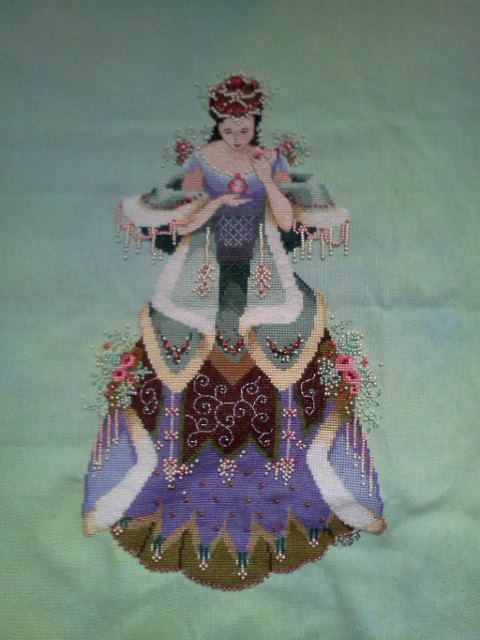 She is stiched on 28 count brittany lugana - I dyed it myself using brown Rit Dye - stovetop method. Saucy little minx! I left out some of the wording in this pattern on the left the pattern says "organic" the right "picked and shipped" and on top "Golden Girl" - I am not opposed or dislike this phrasing - I just thought she was stunning on her own like this. 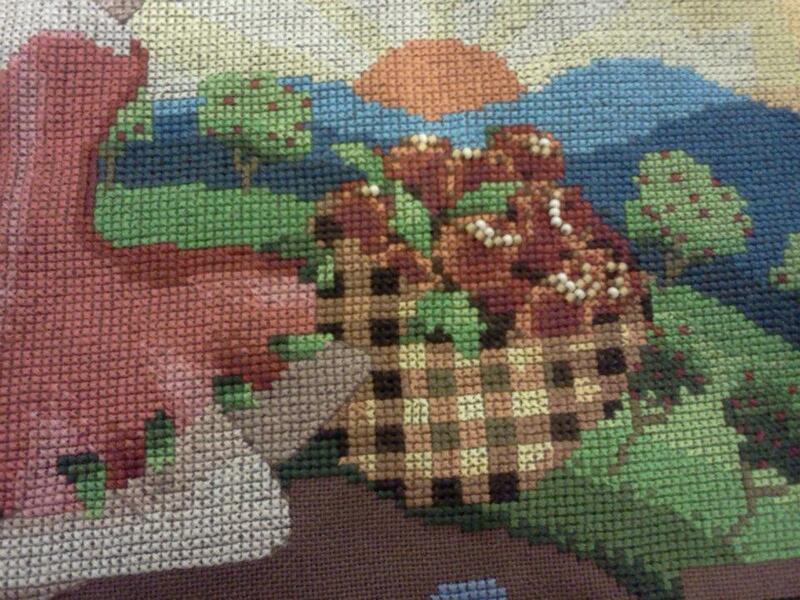 Some details on the basket of apples. 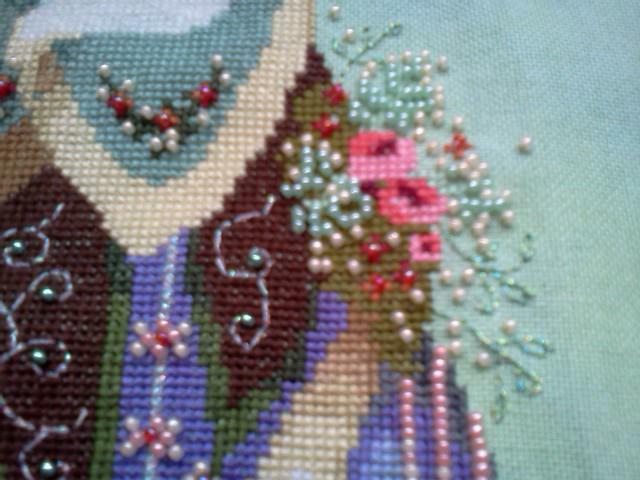 I like beading a lot, but I think this piece could have skipped or used beads in other places. 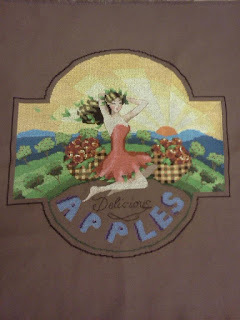 The end result is good, but personally I would have like to have seen the little apple orchard trees use red beads (hind sight) by me! Here are some additional pictures of my finished Mirabilia Scent of Old Roses. This is stitched on Crafty Kitten's Dragon Forest Evenweave on a 32 count. 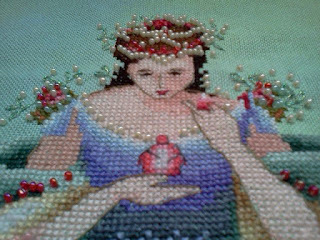 I did change one of the beads - I wasn't fond of a honey coloured bead and I replaced it with the pearly coloured bead. This is a bit blurry - but I wanted to show these details - yup, I learned to Lazy Dazy stitch! I named her Suri. 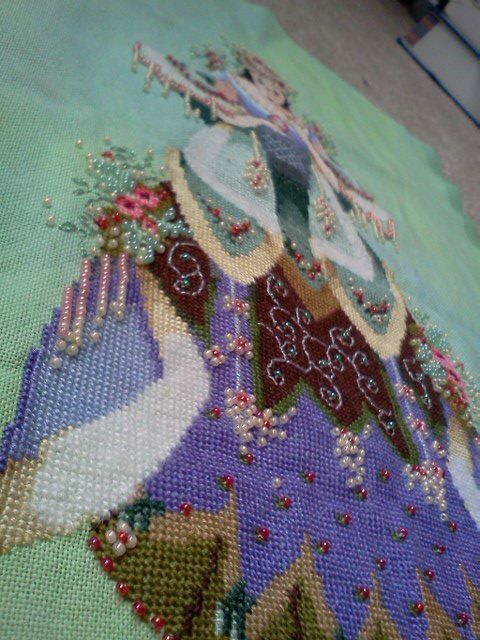 She took about 5 weeks - It may seem fast, but she is a much smaller pattern than Christmas Flourishes. I actually stitched her on a fat eigth with slightly less than 2 inches all around - but you have to use 32 count to do this! 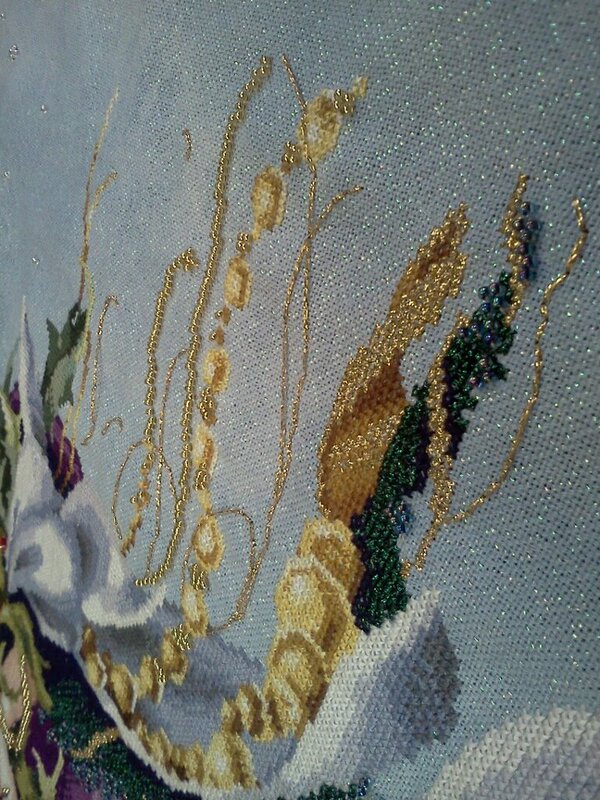 Here are some additional pictures of Mirabilia's Christmas Flourishes on Mystery Blue Lugana by Zweigart. Incidentally, if a pattern doesn't have a name, I like to name them so that they develop their own personalities. I named her Lady Katherine - which I started referring to her as Miss Lady Kate afterwards. Thank you Nora Corbett for designing such amazing patterns! Her beautiful face. As you can see there are a TON of beads in and around her head dress. I love this shot. She dripping with bling. This photo is a great example of her size and some more beading details. Wow - I'm not a very good blogger! I started this blog with the best of intentions and I never really followed through on it. I have A LOT of stitchy updates for you. 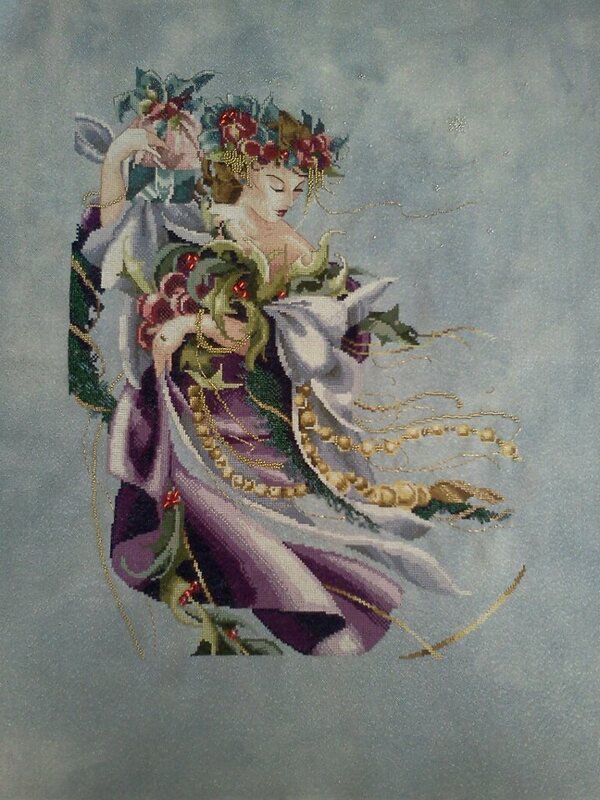 I finished Christmas Flourishes.... She is stunning. I love her so much. 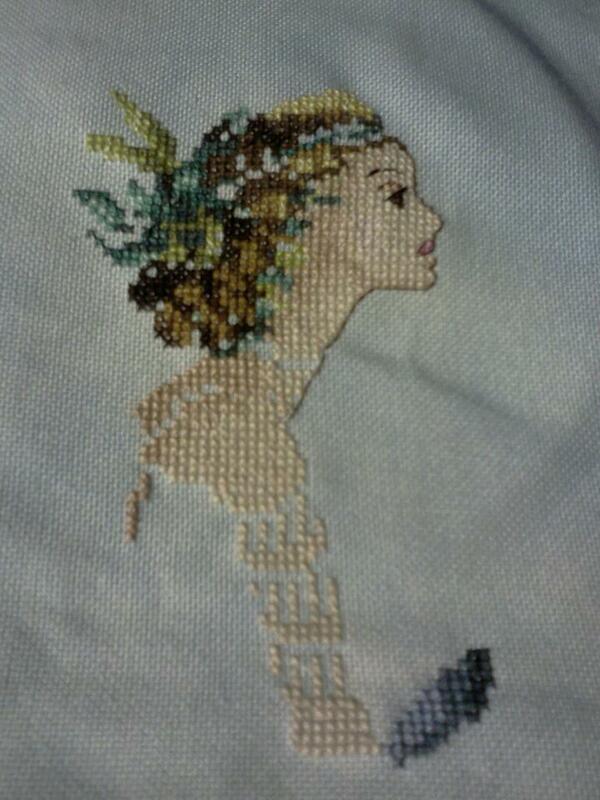 She is stitched on 28 count Zweigart Mystery Blue Linen. This took me 3 full months. It is the biggest project I have ever worked on. The beading is stunning and I will share more pictures in a seperate post. After her, I started and finished Mirabilia's Scent of Old Roses. This project took 5 weeks. 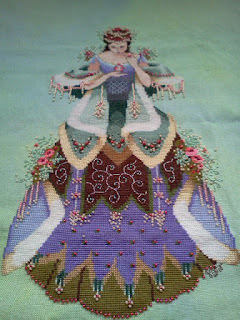 She is stitched on 32 count Dragon Forest by Crafty Kitten. (my favorite fabric company). This one is dripping with beads and is stunning if I do say so myself! I started GG - or Gorja Grace - which is Mirabilia's Golden Girl Apples. This project is stitched on 28 ct brittany lugana. I dyed it myself. This project is so bright and sunny and saucy! I loved stitching her - I wished there was more beads on it - if you are considering stitching might I suggest you change the little red apples in the orchard trees to beads? This project took me 5 weeks to complete as well. So what am I up to these days? I am working on our round robin (which I will make a seperate post about) and I started Mirabilia's Mediterreanean Mermaid - this one is stiched on 32 ct Daybreak by Crafty Kitten.